A little about the Bow Porcelain Company, the factory history and founder Thomas Frye. 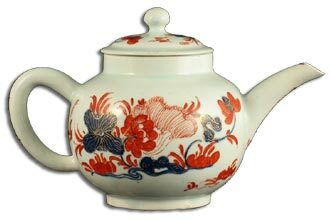 The Bow Porcelain Company was set up in East London to emulate Chinese porcelain and it did it so well that the factory was built according to an East India Company chinese prototype and was called New Canton. But 250 years ago it was Bow porcelain that attracted worldwide attention, thanks to a young Irish painter who settled in the East End of London. Thomas Frye was born in Dublin in 1710 and won acclaim in his native Ireland as a painter before coming to London in 1734. His first success was as a portrait artist when he was commissioned to paint the Prince of Wales, for the Saddlers’ Company, but this was just one among his many other talents which included, miniature painting, mezzotint engraving and enamel work. Frye was also a keen inventor and his love of art and invention came together when he devised a method for producing soft paste porcelain. 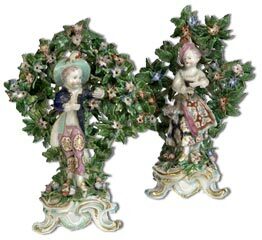 Porcelain was extremely popular at the time but there were two big problems; firstly it was very fragile and second; most items were imported from abroad and were very expensive. As a result of Frye’s experiments with china clay he discovered a method of making porcelain using bone ash. This not only produced a porcelain of brilliant whiteness and luminescence but one of extraordinary durability. In 1744 patents for the manufacture of ware superior to china or porcelain were taken out by Edward Heylyn, a merchant and glassblower and Thomas Frye a painter and engraver. They called their factory New Canton, a direct reference aligning their products with the quality and beauty of the Chinese porcelain with which they hoped to compete. Thomas Frye attracted the interest of the rich and powerful Peers family. The Peers family owned huge tracts of land across Bromley, Bow and Stratford. They were also directors of the all-powerful East India Company; the mainstay of Britains overseas trade at the time, and whose great ships unloaded their imported wares on the Isle of Dogs, near the mouth of Bow Creek. In 1749, with the backing of the Peers family, the bow china factory was set up near Bow Bridge. The Bow Porcelain Manufactory of New Canton was ready to start work with Frye running the operation. The Court Book of 1744 shows that Edward Heylen acquired a property on the London side of the River Lea, at Bow. 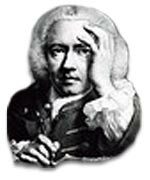 On 7 July 1749, and an insurance policy was taken out for a new works. The factory is mentioned in the 1748 edition of Defoe’s "A Tour of Great Britain" although the original site is uncertain and could have been in Bow proper. The third member of the team was Alderman George Arnold, a haberdasher. By 1750, Thomas Frye and Edward Heylen were in partnership with John Wetherby and John Crowther, who owned a wholesale pottery business at St Katherine by the Tower. The factory was called New Canton and architecturally modelled on the Cantonese warehouses of the East India company. About 1758, Bow porcelain reached a high point, employing three hundred workers, ninety of whom were painters and all under one roof. It was the first purpose built porcelain factory in England and it brought a complete change in the eating habits of the poor who had previously used wooden dishes and earthenware. Business was good and very soon the demand was so great that another factory was opened, this time on the Stratford side of the River Lea. An account of the company’s returns for a period of five years shows that the cash receipts, which were £6,573 in 1750-1, increased steadily from year to year, and had reached £11,229 in 1755. The total amount of sales in 1754 realised £18,115. Bow Porcelain ran a retail shop in Cornhill and a warehouse at St. Katharine’s near the Tower, though the West End shop that was opened in 1757 in the Terrace in St. James’s Street closed the following year. The Bow porcelain company succeeded in satisfying the heavy demand for wares in the Chinese manner, until after 1756 when demand decreased as items decorated with transfer prints or painted in the European style became more popular. Factory marks were very rarely used but you can find mock oriental marks on some Chinoiserie style blue and white pieces of Bow Porcelain. Despite his success Frye was still toiling long hours in the factory furnaces as well as designing new lines and eventually the long hours and gruelling work took their toll. In 1776 what remained of the Bow factory was sold for a small sum to William Duesbury, and all the moulds and implements were transferred to Derby Porcelain. Frye’s work went on, but without his driving force and energy quality slipped. There was another 13 years of production at Bow, but towards the end products were underfired and lacked their earlier translucence and in 1776 the works closed. Thomas Frye’s Bow Porcelain legacy remains. The processes he invented changed pottery forever and one of his daughters went on to work for Wedgwood. You can still find good examples of antique Bow porcelain today and the fact it was well made and tough enough to last for 250 years is testament to Frye’s vision. The man in green hat, blue coat and floral sprigged pink trousers. The woman in pink hat and floral dress. Each with a background of elaborate bocage, on a pierced rococo base, red painted anchor and dagger to underside. Bow factory, London, England, around AD 1760. 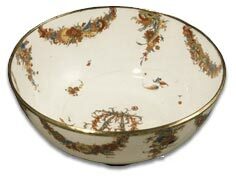 Soft-paste porcelain bowl enamelled and gilt, with a metal mount. Bow Porcelain is very rare and hard to find. As a Bow collector you can look forward to many hours of searching and research before you experience the elation of finding a genuine piece.